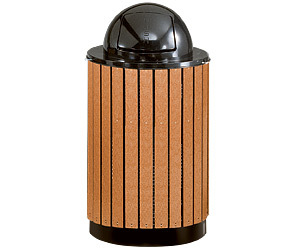 Featuring durable and attractive slats made from 100% post-consumer recycled polyethylene. Also constructed with heavy gauge powder-coated, fire safe steel. Bottom drains prevent the accumulation of water. Folding retainer bands hold poly bags securely in place. Optional dome lid is available and is offered in three colors to choose from. Ships fully assembled. Plastic Lumber Slats Waste Receptacles "Free Standing"